We have a wide range of Troika Pottery for sale including Troika egg cup, Troika Marmalade vases and early Troika St Ives pieces. Remember, if you’re looking for a specific piece then jsut get in touch! This entry was posted in New Stock and tagged Avril Bennet, Troika Coffin, Troika Pottery, Troika vase on March 27, 2012 by Perfect Pieces. We have a wide selection of Troika Pottery for sale at the moment ranging from small vases to larger vases and everyday items such as lamp bases! This entry was posted in New Stock and tagged Alison Brigden, Avril Bennet, Troika Ashtray, Troika dish, Troika Pottery on November 7, 2011 by Perfect Pieces. We have a wide selection of Troika Pottery for sale ranging from lamp bases to early St Ives vases. This entry was posted in New Stock and tagged Avril Bennet, Linda Taylor, Studio Pottery, Troika Cylinder, Troika Marmalade, Troika Pottery on November 3, 2011 by Perfect Pieces. 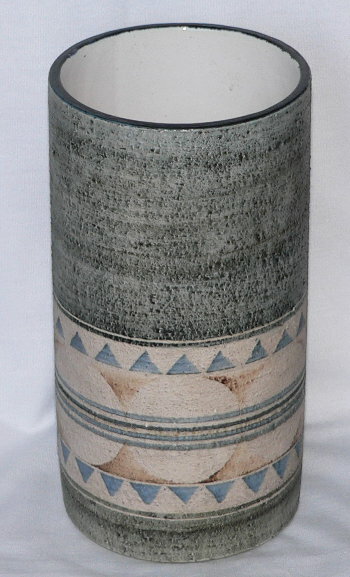 This is called a Chimney vase and is from the textured range that the Cornish pottery Troika produced. This particular example mixes the glazed techniques on the side of the vase with the popular textured finish on the front and back of the vase! Decorated by Avril Bennet who worked at the pottery in the 1970’s it’s a striking example with its blue glazed sides and detailed abstract design. This entry was posted in New Stock and tagged Avril Bennet, Studio Pottery, Troika Chimney, Troika Chimney vase, Troika Cornwall, Troika Pottery on October 19, 2010 by Perfect Pieces. The latest addition to the Perfect Pieces Troika Pottery section is an extremely rare and collectable Troika pottery GIANT wheel vase! This massive Troika vase stands approximately 13″ tall and is the largest of the wheel vase range produced by the Troika pottery. Decorated by Troika decorator Avril Bennet this rare and very impressive Troika vase dates c1973-1979. This vase is not only impressive in size but in decoration too – it has an interesting pattern on one side, the body design. Picked out in greeny blues, oranges and creams the design really stands out against the oatmeal brown base. We currently have a wide selection of Troika pottery for sale, including an early Troika St Ives double egg cup, an abstract face design small wheel vase by Marilyn Pascoe and a bright Troika pottery Coffin vase by Simone Kilburn to name a few. This entry was posted in New Stock and tagged Avril Bennet, Giant Troika Wheel, Marilyn Pascoe, Simone Kilburn, Troika Coffin Vase, Troika Double Egg Cup, Troika Pottery, Troika St Ives, Troika Wheel Vase on March 18, 2010 by Perfect Pieces. Two New Pieces Of Troika Pottery – Little & Large! We have recently added two new pieces of Troika pottery to the Perfect Pieces Troika pottery collection. These are a Troika pottery Cube vase and a tall Troika Rectangular vase, both pictured below. The first Troika piece pictured here is a Troika pottery Cube vase. This piece decorated by Annette Walters is a textured piece decorated with abstract patterns on all sides. Click here for further information and photographs. The second piece pictured above is a tall Troika rectangular vase. Decorated all over with a green base this piece has very interesting patterns on most sides including a horse shoe motif on one! Click here for further pictures and information. We currently have a wide selection of Troika pottery for sale including Troika Marmalade vases, Troika Spice vases, Troika wheel vases, Troika Slab vases and and early Troika St Ives double egg cup. This entry was posted in New Stock and tagged Annette Walters, Avril Bennet, Troika Cube Vase, Troika Pottery, Troika Rectangular Vase on February 10, 2010 by Perfect Pieces. A new arrival to the Perfect Pieces Troika pottery sale section is a super Troika pottery marmalade shaped vase decorated by the popular Avril Bennet. The Troika Marmalade vase is a popular Troika pottery shape – partly due to it’s mixture of textured and smooth finish, it’s size makes it easily place-able in any home and its affordability to collectors. This example has geometric designs on all four sides finished with a dark blue glazed rounded top. It has been decorated by Avril Bennet who worked at Troika when they had a factory in Newlyn in Cornwall. She was there from 1973 to 1979. Click here for further photographs of this Troika vase. This entry was posted in New Stock and tagged Avril Bennet, Cornwall, Newlyn, Troika Marmalade Vase, Troika Pottery on February 6, 2010 by Perfect Pieces. And finally, a super large Troika pottery Slab vase decorated by Avril Bennet. These three Troika vases are all from the Troika pottery’s textured range and all have the Troika pottery black painted pottery mark. Do remember, all our Troika pottery pieces do include FREE UK postage by Royal Mail Special Delivery. This service guarantees next working day delivery by 1pm, is tracked and requires a signature on delivery. This entry was posted in New Stock, Troika and tagged Avril Bennet, Simone Kilburn, Troika Marmalade Vase, Troika Pottery, Troika Slab Vase on January 6, 2010 by Perfect Pieces.